Welcome Serbian, the thirtieth (30) localization (including English) to Cyberduck 3.4 thanks to Milan Radivojević. 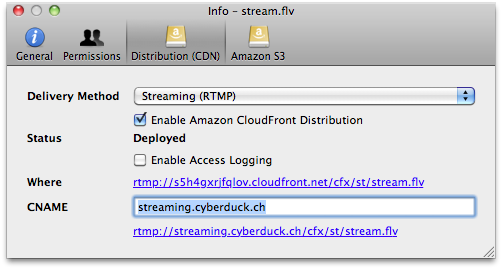 The latest 3.4 release of Cyberduck now supports the configuration of Amazon CloudFront streaming distributions. A dropdown menu in the Info panel allows to choose between traditional basic HTTP distributions and the new RTMP streaming distributions supported. The help section will be edited with updated instructions soon altough the configuration should be straightforward. In the meantime refer to the official Amazon documentation on streaming distributions. It probably has never been easier to distribute a video in the CDN for streaming with a click of a button. Regardless of the file type, Cyberduck 3.4 allows to edit files with your preferred editor from the remote server. This allows to edit not only text files but images and other binary content as well with your preferred application directly from within Cyberduck. The Command-K shortcut and the edit toolbar button will always point to the application set as the default application in the Finder for a given file type. A default editor application can be choosen in the Preferences and set to override the default application that would be used when double clicking the file of a given type in the Finder.